Your mind is an illusion that emerged from mindlessness. Your life is an illusion that emerged from lifelessness. Existence is an illusion that emerged from non-existence. Existence, such as it is, spontaneously jumped out of non-existence, for no reason, via no mechanism and will culminate in pointless Heat Death. You have no soul. You are a mere ephemeral collection of lifeless, mindless atoms. The unconscious is an illusion. You have no choice. Choice is impossible. Human existence is empty. Human beings are husks, hollow beings with illusory minds. Consciousness has no causal efficacy. It can never overrule the laws of materialist physics. Consciousness is a pointless illusion, a meaningless epiphenomenon. It is of the order of unreality. It is a purposeless emergent property. Science presents a picture of humans as “philosophical zombies”, hypothetical beings that seem indistinguishable from normal human beings but actually lack consciousness and sentience. They simulate these things. They do not possess them. Existence, says science, is governed by chance, accident, randomness, acausation, indeterminism, indeterminacy, probability, statistics and emergence. Physicist Max Tegmark said, “A conscious person is simply food rearranged.” This means that your consciousness is reducible to food. This means that all food is potentially conscious, and at the very least contains the seeds of consciousness. Science is a shallow, banal subject mired in materialism, atheism, skepticism and nihilism. It is a ferociously anti-life ideology. Lifeless matter is, after all, the essence of non-life. What kind of people go out of their way to deny meaning and purpose, to trumpet that existence is pointless, that we have no free will and that our consciousness is an illusion? The central thesis of this book is that science is a worldview born from autism, from people who struggle with communication, empathy, free will, consciousness and all things mental. Scientists prefer to see themselves as machines or as products of random chance. Their lack of a strong psyche translates into an affinity for matter, the opposite of mind. They feel at home with theories that exclude mind, that require no mental components whatsoever. That’s because they themselves are enormously deficient in mind. The intellectual agenda of the world has been seized by autistics. They control science and computing, which now drive the world. Everyone in the academic world now falls into line with their anti-mind ideology. People even believe that machines can be as conscious as human beings (how would that be possible unless humans themselves were just glorified machines?) and that consciousness can be uploaded to computers and stored there. Philosophy has been destroyed by autistic science. All academic philosophers feel the need to parrot the nostrums of scientism, and to deny the reality of a world of purposeful minds. It’s time for the People of Mind to strike back, to take back the intellectual world from the autistics, to replace materialism and empiricism (the ideology of the senses) with idealism and rationalism (the doctrine of reason and logic). So, are you a philosophical zombie? Are you an accidental, random, purposeless arrangement of death and non-existence that manifests will, reason, desire, hopes, thoughts, dreams and HAVE actual dreams for no reason, by no mechanism, for no purpose, by no utility? 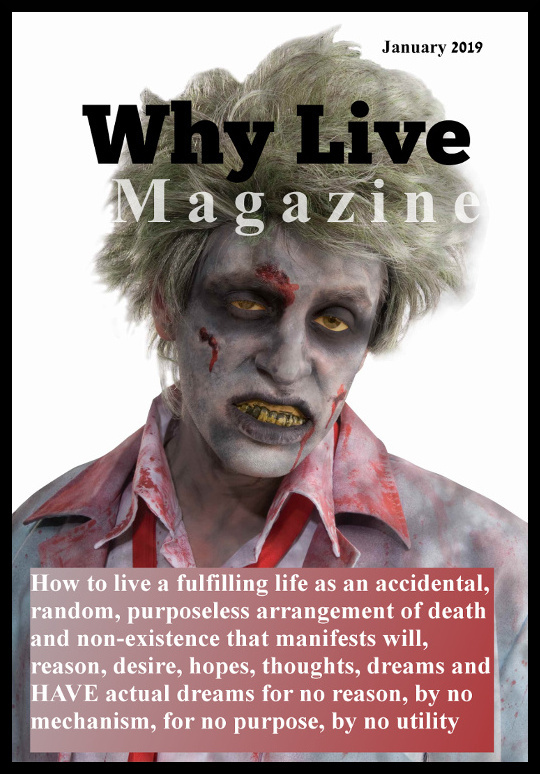 Can you be dead and alive (which is just a special type of death) at the same time? Can a bomb be exploded and unexploded at the same time? Is existence not real? Are you not real? Do you have no purposeful thoughts, no meaningful thoughts, no directed thoughts? Are you an automaton that would continue to function just fine without the nuisance of the totally unnecessary epiphenomenon of mind and free will? Another scientist reported that they thought that my book just seemed like an attack on science that the average person might become convinced by and thereby lose their respect for science. I told him that that was exactly what I intended, was for the average person to see just how ridiculous modern science is, that it accepts and offers flat Earth theory as its most important work in modern times! There is nothing in the scientific mindset that anyone can legitimately point to and say which offers a healthy perspective on human existence. Nothing. It seems that the entire edifice of modern science and related academia is an attack vector on the human species, on the human mind. When people refer to the value of science, they are merely referring to their gadgets, their technology, their ease of life, their useless distractions which science has produced which incidentally is claimed are bad for existence because they require energy and our energy emits carbon dioxide which is therefore evil and will destroy the planet with weather, even though carbon dioxide is the basis of life. Ask yourself: What kind of sick people believe that bombs can be exploded and unexploded at the same time? What kind of sick minds willingly subscribe to ideas which relegate their lives as unreal, purposeless, meaningless, mindless, accidental, random and valueless? How perverted and sick must one be to adopt such thinking about oneself and of existence? What kind of sick people believe that flat Earth theory absolutely tells us important things about the way that the Earth and physics functions? What kind of mental disease does one have to be subject to in order to think all of these things?! What science merely did was to create these ridiculous ideas and blatant logical paradoxes in order to protect itself and its academic racket from inspection, from anyone checking to see if they’re actually doing anything useful. It created these stupid, ridiculous ideas and told normal, healthy people on the outside that if they couldn’t understand it then the reason was because they lacked the intelligence, that they were “stupid”, and that they lacked the smarts to engage. The truth, that all normal people know, is that paradoxes cannot actually physically or meaningfully exist, and science and academia presented their ability to adopt cognitive dissonance and sophistry as their bar for acceptance and “intelligence”. Normal, healthy people weren’t allowed to engage with science anymore if they wouldn’t renounce reason and reject paradoxes before beginning – you could only engage science on science’s own invented terms, terms which had nothing to do with the intellectual tradition and intellectual philosophical history, or reason, or consistency, or coherence, or coherence even to science’s own supposed standards itself, but only the terms of cognitive dissonance. The only reason the average person has any respect for science is because 1) it gave them gadgets and pretty pictures, and 2) they have been led to believe that there is an intellectual barrier to cross in order to engage with science that they themselves do not qualify for, when in fact that barrier is entirely smoke and mirrors, entirely the front of pretending that really stupid and impossible and sophistical ideas are the truth, which then merely confuses the normal person and causes them to shrink away while they give the benefit of the doubt. As I discussed in my book, and as Tanner shows in his book, is that science has no rational or coherent basis whatsoever, even on its own terms. Science ostensibly holds the Falsifiability Principle as paramount, and holds “to observe” as sacrosanct, yet, you cannot observe an exploded/unexploded bomb, and neither can you falsify (or prove) an exploded/unexploded bomb. Science violates its own terms and conditions at its very basis, in its most “important” theories, etc. You’re not looking at a rational or productive enterprise here with modern science…rather, you’re looking at an attack on consciousness, at an attack on the mind, at an attack on people and trying to convince people that their lives are meaningless! Does science give society a healthy philosophical orientation around which its people can think of themselves and to develop under? The very question is absurd…science seeks nothing but to destroy humanity and consciousness…it is the most directed attack against humanity as a whole which has ever occurred, which humanity has ever had to survive. The philosophy of genocide, of ultimate self-extinction, is the immediate end-point of modern science. While Hockney provides the entire philosophical basis of the ridiculousness of modern science, I have provided a real-world and easy-to-understand example that exposes the sheer magnitude of idiocy of the entire edifice of the scientific academic establishment. They are, almost to the last man, flat Earth theorists, and they will go out of their way to defend it! When the rare scientist engages with me on these rational questions, they only seem to take it as, and only ever accuse me or question me of, simply attacking science for some unknown reason, that I must be a science denier. That’s as far as their thinking goes, that seems to be the ultimate depth of their ability to reason things through. They seem unable to identify or to grock that what I’m criticizing, and what I’m attacking, are bad ideas such as flat Earth theory being the basis of climate alarmism, and bad ideas like bombs being both exploded and unexploded, and bad ideas like life must be meaningless and purposeless (which is a direct result of the exploded/unexploded bomb fallacy believe it or not! ), etc. I am a scientist, and I make a living in science. What motive would I have in simply “attacking science”? They seem entirely unable to consider that I might have a legitimate motive focused on improving science, based on criticizing science’s existing silly ideas like the flat Earth theory of climate alarmism, and the meaninglessness and purposelessness of exploded/unexploded bombs which fly in the face of the scientific method in the first place. They seem unable to detect the incoherences I am plainly point out and instead think I must simply wish to attack science…when what I am attacking is science “accidentally” accepting flat Earth theory, science “accidentally” accepting cognitively dissonant philosophy and ideas at its basis. They simply seem to be not thinking at all…not capable of reflection and logical analysis, or imaging purposeful criticism, etc. At this point, sure, I am attacking science, because science is obviously in a very bad way if it is unable to reflect upon the logic of flat Earth theory, the logic of exploded/unexploded bombs, the logic of being 100% dependent upon mathematics but then ridiculing that mathematics has anything necessary to do with reality, etc. And so, sure, you’re goddamned right I’m “attacking” science, if that is all of the imagination that you’re able to generate and ponder on someone who criticizes extrapolations from flat Earth theory as being valid physics. So what has science produced? It has produced a grotesque, lazy, anti-spiritual species that hates itself, that lives for gadgetry and gadgetry alone, and playing with gadgetry, and becoming more intimate with gadgetry than with other people, etc. Look at “science” producing life-like blow-up dolls for male companionship. This outlook of meaningless and purposelessness are the most soul-crushing ideas ever produced by humanity…and while you may rightly criticize religions, at least most religions wanted you to live, wanted you to have some purpose for living. This religion of scientism, the religion of scientific materialism, is indeed a religion for philosophical zombies, and one can only consider that it is indeed some form of philosophical zombie, i.e. the “autistics” as Tanner identifies them, which created it. Some machine species. We damned well have to fix this, and we know exactly where to start. I showed it and talked about it my book, and Tanner and Hockney (etc.) have likewise identified precisely where we need to start. And it is obvious where: science’s stupid ideas, like exploded/unexploded bombs, and its irrational hostility towards mathematics and Idealism in general. Footnote: The few times that Tanner, in this book, trashes Trump and “the right”, you will certainly recognize cognitive dissonance here and those phrases are put there for a purpose: because machines cannot recognize contradiction, or cognitive dissonance, etc. They’re put in there to confuse the machine-people enemy. The idea that today’s left, which is synonymous with and the result of Scientism, has any connection to reality, reason, rationality, empathy or sympathy, kindness, or General Will to the good, is obviously a farce. I’m pretty sure that the Hockney writing group or some extended branch of it is in some way connected to the Q operation and the Trump presidency, and Tanner actually makes that case, although not directly, in another one of his books. PLEASE read Tanner’s book. Human civilization, and your very soul, depend on it. Seriously! That’s not an exaggeration. I’m 100% serious. That’s the war we’re facing today, the war we’re in today. Meaninglessness and purposelessness of the philosophy of scientific materialism. The best of all possible worlds, the best of all possible outcomes, the greatest meaning and purpose imaginable from Idealism and Rationalism, expressed in reality through our very own lives via Ontological Mathematics. Gallery | This entry was posted in Fraud of the Greenhouse Effect. Bookmark the permalink. So, what’s the difference between an introverted scientist and an extroverted scientist? BTW, the rumors of materialism’s demise are greatly exaggerated. What is the alternative? The Bible? The alternative is Mathematical Idealism, reason, rationality, and the final expression of these things in Ontological Mathematics. The best of all possible worlds. Your soul and what you’re supposed to do with it, and what you’re going to be. The alternative to Materialism is Idealism, and reason. Granted, no one knows what Idealism now is today, and granted, most everybody thinks that it is either matter, or the Bible. But Idealism as the proper philosophy was never refuted, it simply stopped being talked about because science was producing a lot of gadgets to be distracted with. The fundamental points in Idealism however have always remained, i.e. that the only thing we can be sure that exists is our mind, that our senses do not show us true reality, that only reason can show us what existence is actually made of, that it is a category error to claim that dead lifeless matter can arrange itself in a special way to begin thinking, etc. Science, because it could produce entertaining gadgets, simply made everyone kowtow to the false idea that Idealism didn’t exist anymore. It is materialism which produced flat Earth theory in modern physics, materialism which produced exploded/unexploded bombs and alive/dead cats, materialism which produced purposelessness, meaninglessness, the unreality of existence and random probability as the basis of existence, etc. All paradoxical and undemonstrable and unprovable ideas. Materialism doesn’t teach us to claim value for the sake of our existence, but actively teaches that any value we claim is merely expedient, not really necessary, and ultimately pointless. Indeed it was God that used to give man meaning, but god is dead, as Nietzsche killed him. It seemed that there was no meaning left out there, save that which you could give to yourself. Science never bothered to teach that, though. It definitely went with purposelessness, and meaninglessness, etc. Idealism and reason taken to its final conclusion is Ontological Mathematics. And from there, everything is explained…the only possible grand unified theory of existence. Existence is alive and it has a purpose, and we are all part of that purpose. And the purpose is to become God, just as Nietzsche intuited. Our purpose is to perfect ourselves. Welcome to the Nihilistic World Order, brought to us by our betters! You have clearly been fighting this battle for a while. Have you tried to contact Mark Stein who is also fighting this battle? Yes you know I figured Canadians needed to stick together. More than that the exposure would be huge for the truth about AGW. I can’t imagine both of you fighting this for so long and NOT crossing paths through some causal link, but hay, it does happen. I think that the idea of a “soul” is too simple. It’s too fragmented from the idea of the universe/multiverse/whatever-verse. It separates identities too completely. We’re all mixed up together in this being/existence/reality. We have a moment of unique expression in it, and then we dissolve back into it. They really do think that about themselves and about the rest of us who haven’t lost our minds to cognitive dissonance. It’s not about a rational debate with us, it’s not about legitimate alternative concerns, it’s not about any valid insight…we’re just racists and bigots and supremacists and have privilege, and so, we’re not real people after-all, and we better just listen to those are so obviously intellectually and morally superior to us. I have not come across Mark Stein. Links? Yes, what I write does require an understanding of the word “soul”. It comes from the philosopher and mathematician Leibniz, and his Monadology, but now extended and updated to current, and really final, philosophical and mathematical standards. Basically, and I wrote this in my book, existence is a living mental substance, universal, transcendent, and immanent, of which we are individualized nodes or expressions of, called monads, which can also be called souls. That is certainly true, and we’re all here for the same reason, for the same purpose, etc. That’s somewhat like the Buddhist conception of existence, yes? But the monadology and souls doesn’t separate us…we’re not separate substances. Our souls are all made of the same thing, and all have the same purpose. We have unique identities and are unique expressions or nodes of the mathematical mental substrate of existence, but, we are all expressions or nodes of the same mathematical mental substrate of existence. We are both object, and subject. The soul, when understood through reason, i.e. through the Monadology and Ontological Mathematics, mathematical idealism, etc., does not make us fundamentally separate and unique, but fundamentally the same, just with our own unique vantage point of coordinates. You could be the twin mind of another person with whom I used to have deep philosophical exchanges. He made a strong appeal to Leibniz too, and he spoke of mathematicians doing math whose meaning they did not understand. I helped him word the preface of his monumental self-publishing venture of over six hundred pages, which encased the most obscure use of language that I’ve ever encountered. I did, however, read his book, even though I felt his brilliance was lost in the obscurity of the language. Reading it, thus, was somewhat torturous. (^_^) But I committed and did it. He also did not pull punches in his responses to his fiercest critics, with whom he often battled over the very issues that you discuss in your blog — climate-change alarmism, historical scientific errors, particle-fluid-duality contradiction, … reconciling such contradictions by shifting perspectives and approaches. He is a master digital artist too, who makes me look like an amoeba, by comparison. Your article is an insult to autistics, of which I am one. And I know and have communicated with plenty of other people on the autism spectrum. You are promoting a completely false image of the autistic mind. However, what you say is correct, it just has a different name: Sociopathy. This is who is driving our world toward death and destruction. Sociopaths. Think about it. Sociopaths have no conscience and will lie, cheat, steal, and kill to get what they want if possible. There are no barriers in place to prevent sociopathic people from rising to the top, and given their ambition, that is where they have been accumulating for centuries, at the top of government and industry. They are responsible for the mess we are in, not autistics. I hope you will take time to educate yourself about the autism spectrum and actually get to know some autistic people and stop blaming us for such crimes we are not responsible for because you have an important website debunking AGW. Autistic people are grossly misunderstood. Please educate yourself and stop making our lives worse with this kind of misinformation. Yes autistics certainly are not responsible for their condition. At least you wouldn’t think they are. Unless one considers that they purposefully incarnated into such a life, because that’s what they wanted…but then who knows…lol. I entirely agree with re-casting it as sociopaths. I think that Tanner, though, would point out that sociopathy comes out of what are considered “autistic” mental and emotional traits, such as having no or poor theory of mind, poor empathy and sympathy abilities, etc. In any case, yes, good comment. In Tanner’s philosophy and generally that of Ontological Mathematics, nothing truly happens by accident. All souls, when they incarnate, choose the life they want. And so, at the soul level, people with autism would be considered responsible for their condition, and hence responsible for what follows from their condition. One could consider that machine-minds would be more comfortable incarnating into autistic minds, etc. And so there’s that whole idea of machines now being able to incarnate into the human race, etc. I know we always consider ourselves as SUBJECT to the forces and conditions we wake up and find ourselves in, as if we have no responsibility for creating them…but, the idealist interpretation, and that of almost any “channeller” I’ve ever read, have universally said that whatever our condition is in life, we chose it before-hand. Tanner, given his position on things and where he comes from, would entirely consider it legitimate to directly blame autistics for what their condition has brought to the world. Which is more sociopathy. Do you guys have any peer reviewed papers written against global warming or experiments involving Co2 or anything? I’ll read anything you link me to. Even if its 50 links (I wish I had about 200 peer reviewed papers against global warming). I know “peer reviewed” has been defaced by the AGW crowd but it’s still a door open for a honest reader. Not many of those anymore that turn from the AGW religion but maybe a few who are on the fence. Any other links feel free to send my way. I am on disability and I have nothing to do all day but learn more and fight with ignorant fools over global warming. Thanks to you guys people aren’t as willing to debate me on YouTube anymore. One even blocked me. That’s all because of you guys they are reluctant to argue with the science. I even had one poster tell another not to engage me because of my links on my channel. The only thing I have linked on my channel is you, Jo. You and the Slayers are making a difference. Thank you so much Robert! I also have an astrophysicist question. Please remember to dumb it down some for me: Does the Sun’s movement through our Galaxy effect the magnetism of the Sun and in turn our climate and is their any connection to warming ages and ice ages? I know the Solar Minimum and Maximum, the Milankovitch Cycle? and I just don’t know how they all connect or if it does. I noticed alarmists are getting fixated on ice ages now for some reason. Again, thanks so much for your help. I wish we lived in a after Matrix time where I can just download all this stuff to my brain. Yes, I CAN add and subtract. Christopher M – “Do you guys have any peer reviewed papers written against global warming or experiments involving Co2 or anything?” Here are two of them: http://tech-know-group.com/papers/Role_of_GHE-EaE.pdf and http://tech-know-group.com/papers/Role_of_CO2-EaE.pdf The GHE “measured in a lab” only proves the heat capacity of CO2, that’s all. There’s a simple synoptic essay as to why the AGW’s radiative GHE is an invention and can not exist in the real world: https://climateofsophistry.com/2019/01/10/how-long-is-twilight/ Be weary of the GWPF and even CFACT as they refuse point blank to debunk the GHE. Anyone else hear about this? I’m curious it’s from 2015 so what’s the real story behind it? Never mind I got the jist of it: “The increase in DLWR was due to the warmer troposphere during the El Nino. Warmer air emits more longwave radiation. The higher concentration of CO2 will also emit more DLWR radiation, but that is not due to increased absorption.” and they tried to claim this was Co2 warming up the surface. These people are loathsome buggers. I hope if you guys finally blow the lid off this you get a Nobel for it or a medal from Trump. They have nothing left but insults and self-imposed ignorance. Yes, probably. Definitely I would think. A lot more research could be done here by solar physicists, but by now they steer clear of linking solar activity with the climate. Imagine that hey? Avoiding making a link between the Sun and the climate. And yet, that’s what alarmism has brought us. The sun, like Earth’s atmosphere, is invisible when it conveniently makes the math come out right to support climate catastrophe.